The Bioscope is five years old today, and it’s time for a change. We have had the same template all that time, and though it had its plain virtues I’ve wanted for a while to give the site a fresh look, while not upsetting the general balance of things too greatly. So here is the new look. As you will see, we have the same name, the same subtitle, the same banner, and the same features (with a few tweaks) down the right-hand side. The search box is now positioned top left. The top menu has been simplified. Instead of the old Calendar, Conferences and Festivals sections, there is now an Events section (which is the renamed Calendar) with sub-menus for Conferences and Festivals. So no information has been lost, indeed the Conferences section now has a (hopefully) handy listing of past conferences with links. The Library section remains as before, with main part a listing on freely available e-books on silent film, and sub-categories for Catalogues and Databases, Directories and Journals also available online, now with a clearer drop-down menu to guide you to the right section. Other changes will be made over the next few weeks as I get used to the template and maybe make a few small cosmetic changes. I’m aware that the FAQ section is in needed of a refresh, and I also need to check all of the links on the righ-hand column, a number of which are now defunct. 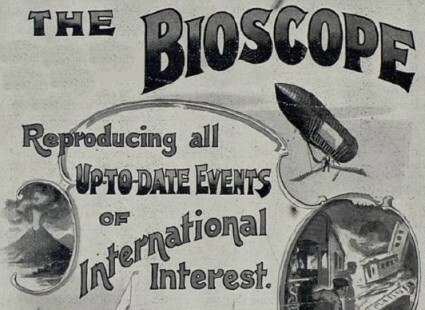 If you are new to the Bioscope, then a particular welcome to you. This is a website (in the form of a blog) dedicated to providing information on early and silent film. We range widely in our interests, from pre-cinema technologies through to the modern silent film today, with strong emphases on research and online resources. There is an overview of the site on the About page, which includes a lsting of some of the key informational posts we have produced in the past. Browsing through some of these will give you an idea of what we’re about. We also have a Twitter feed, Flickr site, YouTube channel, a Vimeo channel and a daily news service (courtesy of Scoop it). It’s been an interesting five years, during which I have written enough words to fill five books – which is both worrying and heartening. Sometimes I wonder at all this energy devoted to the ephemeral online world, but then I reason that each new post gets more views per day than most of the academic papers I have written have had readers over years, which must mean something. And then I do have my moments when I wonder what the point of it all is, indeed why the focus on silent films when there are other things in this world that divert me quite as much, and at such times I have thought of closing the site down. But then someone makes a comment saying that they like a particular post, or I meet someone at some film event who says how the find the Bioscope useful, and I realise I must press on. So thank you, gentle readers. Do let me know your thoughts about the new site. It should look better on today’s bigger screens (though I am defiantly holding on to my Academy ratio laptop for as long as I can), and there small additions like the email and print options which I hope will be useful. I am always open to suggestions for new features, subjects of posts, events to promote (with a tendency towards the international), and resources to highlight. I don’t know if the Bioscope will continue for another five years, but the next target is a million visitors, which all being well we should attain some time later this year. Love the new design. Looks more like a printed journal – but not in a faux-antique way – which somehow seems right. Thank you. I think I like it. A change was needed, anyway. It’s just the off-the-shelf template and I will be tinkering a little with the CSS to get it just right (the header and title need work). Cool. Congrats on five years! It is necessary to adapt to the new times, to reject the ailing cult of the silent past and its inflexibility?? ?… well, if the purpose of this is to share to the newly longhaired youngsters generations the spirit of their forefathers, well… mission accomplished!!. It looks really great. Five excellent years. Congratulations and very well done. Thank you everyone. The general intimation seems to be that it looks both of the past and of the present – for the short-haired and the long-haired. That’s how we want things to be. Congratulations on your fifth anniversary. I like the new template. I always like the content.